As a dentist it is really exciting when I can offer my patients a way to improve their quality of life by giving them back the ability to eat, enjoy food and feel confident. It is especially gratifying when all of these things can be accomplished while also giving them back their youthful appearance. I sincerely believe that the way a person feels about how they look directly affects their overall outlook on life. Dentures have long been used to replace missing teeth. While some people have no problem wearing dentures, many patients simply cannot wear them comfortably for various reasons. The biggest complaints I get from patients are problems with the fit, the feeling that the denture does not look natural and the idea there is no other alternative but to live with what they have. They think this is simply the best they can do. Not so! There is an exciting, precise, aesthetically pleasing alternative that can literally change your life. Age Defying Dentures! 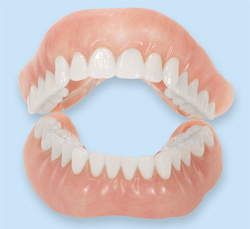 THE ECONOMY DENTURE - these dentures come in sizes small, medium and large. They are often considered a “temporary” denture. THE TRADITIONAL DENTURE - these dentures are a bit more customized to the patient’s individual shape and size of the denture and teeth. For some patients, these types of dentures are fine, but for others they are looking for something better. AGE DEFYING DENTURES - these dentures are made to the patient’s ideal facial proportions. The denture also gives the patient back the facial support that was lost when their teeth were removed and bone structure changed. This will eliminate that sunken in look. The bite is equilibrated and balanced for effective chewing and the denture holds the jaw in the ideal position to alleviate muscle fatigue and discomfort. It plumps out lips, reduces wrinkles, brings out the chin and reduces the “turkey neck” appearance. 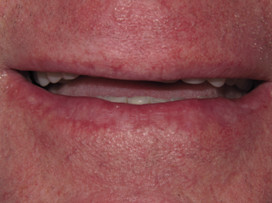 The technique and technology used in acquiring and creating an Age Defying Denture is far advanced beyond the older, traditional way of making a denture. Different steps are used and precise measurements are made to create the perfect bite, balance and structural support. The difference these techniques make is quite dramatic. Notice the change in the appearance of the upper lip, now having no reverse smile. The front teeth are visible and look natural. The difference the Age Defying Denture made for this patient is amazing. He looks ten years younger and is ecstatic with the results.